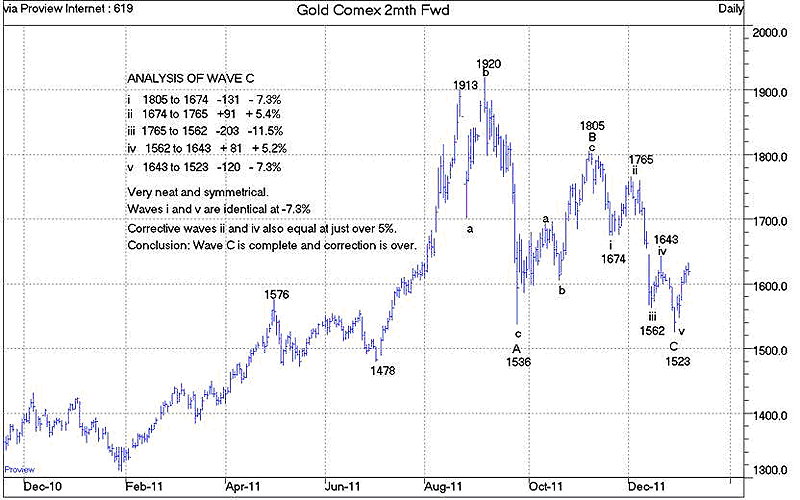 The Elliott Wave (EW) justification for thinking that the correction in gold is over. Why corrections happen in gold from a fundamental viewpoint. The extent to which manipulation affects the gold price. A possible "black swan" event that could trigger a gold price surge. In this case, the A and C waves are equal in percentage terms at 14.5% and 14.7%. The overall decline from $1895 to $1531 is -$364 or -19.2%. My speech to the Sydney Gold Symposium last November - showed that the largest corrections in the previous Intermediate wave from $700 to $1895 were about 12% in PM fixings. The forecast was that the current correction from $1895 would be one degree of magnitude larger than 12%. A decline of 19.2% qualifies as one degree larger than 12%. The Gold Symposium speech suggested that the correction would be between 21% and 26% in spot gold prices. The actual decline was from $1920 to $1523, a loss of -$397, or -20.7%. This is just below the target range but qualifies as one degree larger than the 14% corrections in the previous up move from $680 to $1913. The probability of this analysis being correct is high, perhaps 75%? Smaller probabilities allow for: (i) this to be an A wave of a larger magnitude correction; (ii) the current correction becoming more complex, perhaps reaching the lower price targets (e.g. -26%); and (iii) the possibility of deflation, defaults and depression emerging, also testing lower price targets. The up move just starting should thus be Intermediate Wave III of Major Wave THREE, the longest and strongest portion of the bull market. The gain in Intermediate Wave I from $680 to $1913 was 181%. The gain in Intermediate Wave III should be larger, at least a 200% gain. A gain of this magnitude starting from $1523 targets a price over $4,500. The largest corrections on the way to this target, of which there should be two, should be in the 12% to 14% range. Gold is unique amongst metals, partly because it is not consumed, but also because it has some unusual qualities. It has no utility value. One cannot eat it or drink it. It earns no income, does not corrode and does not tarnish. Other qualities include divisibility (a quantity of gold can be divided into smaller quantities) and it is fungible, (one ounce of gold can be substituted for another ounce of gold of the same degree of fineness). There are large stocks of gold available and new annual production has generally been less than 2% of the stock of gold. These are the very qualities that caused gold to be used as money over the millennia. Other metals and commodities are produced for consumption. When their stocks build up due to supply exceeding demand, holders become forced sellers due to the cost of storage or due to spoilage. Thus the price of the commodity drops to a level where marginal producers go out of business until demand exceeds supply. Then stock levels decline until they are exhausted and conditions of shortage prevail. This results in sharply rising prices for that commodity, eventually attracting new suppliers. In soft commodities, weather conditions can also play havoc with stock levels, causing dramatic price changes. The point is that with all commodities other than gold, stock levels are important determinants in the price of the commodity. Gold has been accumulated over the years because it was money or as a hedge against a range of fiscal, economic and political risks. The stock of gold relative to new annual gold production has always been high. In 1971, when the $35 per ounce link between the US dollar and gold was severed, it was assumed that all the gold produced throughout prior history was about 90,000t. This is a rubbery figure and should probably be a higher number. As it is not important to this discussion, we will use 90,000t as a starting point. Over the centuries some gold was lost or was no longer available to the market. If we assume that about 15,000t was lost, it means that in 1971 about 75,000t of gold was available to the market. New production in 1971 was 1,450t, less than 2% of the available stock of gold. One reliable figure available in 1971 was that gold held by central banks and official institutions was about 37,000t. By deduction, the remaining 38,000t of the available stock must have been owned by investor/hoarders in the form of bullion, coins or jewelry. New production of 1,450t in 1971 was meaningless when compared to stocks of 75,000t. The future gold price was going to be determined by what existing holders of gold did with their stocks and what the level of demand would be from new buyers. For several reasons there was considerable new buying of gold during the 1970's, resulting in a sharply rising gold price. Fast forwarding 40 years to our current situation, new mine production over this past 40 year period may have been about 90,000t, of which perhaps 10,000t has been lost or consumed by industry or in jewelry not suitable for reclamation. That leaves 80,000t to be added to the 1971 estimated stock level of 75,000t, giving a current total gold stock of 155,000t. Recent annual production has been about 2,500t, which is still under 2% of the available stock. Whereas the gold owned by central banks and official institutions in 1971 was a reliable amount of about 37,000t, we no longer have accurate figures for gold held by official sources. We know that central banks have reduced their holdings over the years, either by selling or leasing. Central banks no longer publish accurate figures of their gold holdings, but for purposes of this discussion, let us assume that the current level is 30,000t, a decline of 7,000t from 1971 levels. The central bank sales of 7,000t must have been absorbed by the investor/hoarders, taking their adjusted total to 45,000t before adding the 80,000t of new production since 1971. That means that new buyers have entered the market over the past 40 years and have swelled the total gold held by investor/hoarders to perhaps 125,000t. (38,000+7,000+80,000). That is a lot of gold! These numbers are guesstimates as there is no way to substantiate them. The important thing is that the trend indicates that investor/hoarders must own a considerable amount of gold, at least several times larger than the quantity held by central banks. Whenever gold goes to new all time high prices, all investor/hoarders have a profit on their holdings of gold. When the gold price rockets $400 per ounce from $1500 to $1900 in just seven weeks, as it did last July and August, the profits available to investor/hoarders are vast and mouth watering. Not surprisingly, many decide to take some profits while new buyers become cautious due to the rapid price rise. The result is a correction in the gold price. This is a normal occurrence and will happen from time to time, especially when the gold price pushes to new highs. 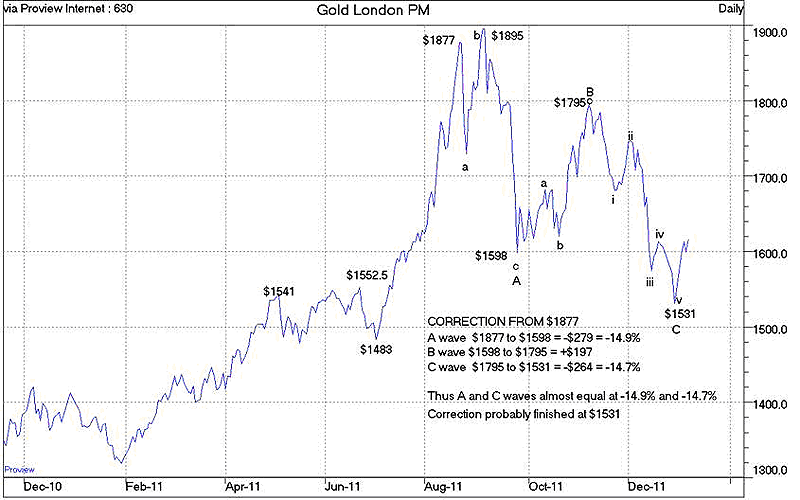 The natural result of a large stock of gold held by investor/hoarders is that occasional corrections must be expected. It is hard to visualize much manipulation in the physical market for gold when investor/hoarders own 125,000t and the volume traded is large. The futures market is another story. Gold futures trading became popular in the 1970's when the price was freed from its $35 per ounce collar. It was possible to control a large amount of gold for a deposit of 10% or less, enabling punters to gear up their positions substantially. There are many similarities between casinos and futures markets. In a casino the house holds the punter's money and issues plastic chips for them to gamble with. The odds offered by the casino always favor the house so that there are always more losers than winners, the difference being the profit margin for the casino. In the futures market, every transaction requires someone else to take the opposite bet. Both parties put up the necessary deposits which are held by the market operator. Again losses will always exceed gains, the difference being accounted for by the brokerage and market costs. In a casino, if one had an unlimited amount of money, one could devise a method of escalating bets so that when one eventually had a win, all prior losses would be recovered plus the desired percentage profit. For example, in roulette over a lengthy period all columns or dozens (the 2 to1 shots) come up slightly less than 33% of the time. A player betting on one of these with unlimited funds would know that sooner or later a winning bet would occur. When it does, the player recovers the cumulative losses plus the desired percentage profit. A foolproof system? Not quite. Casinos impose limits on each table for every bet, which prevents this. In the futures market it is possible for players with unlimited funds to operate a similar system on the short side of the gold market. As explained in the previous section, corrections do happen in the gold market, especially after the price has risen to new highs. If the player knows that a correction will occur eventually, with unlimited funds he can increase his short position at higher prices until the correction happens. Then he closes his position, hopefully banking a profit. This could be circumvented by imposing limits on the size of the position that a player can build, just as the casinos impose limits on each type of bet. This is extremely difficult to regulate and monitor in the futures markets. The authorities probably rely on the knowledge that every contract sold short has to be bought back at some time, thus the position is self-correcting. This is true, but the manipulation aspect occurs when the correction has started and the player with the big short position gives the market a nudge on the downside, triggering stop loss orders. Most players on the long side are operating on margin. That is the attraction of the futures market, to gear up profits. These players are operating with limited funds, so they either have stop loss orders in place, which become market orders when triggered. Or they fail to provide additional cash when their brokers ask for more margin, which causes the broker to sell out their positions, once again placing sell orders "at market". "At market" orders are sold at whatever the best buying price is available at that time in the market. If this happens when markets are thin and the major markets are not operating, this can cause an avalanche of selling. The sharp downward spike on 26 September last year is typical of what can happen in these circumstances. That is the time when the "deep pockets" player will probably be covering his short position. It should be obvious from this that the futures market is an extremely dangerous place in which to participate in the gold market. There are other risks that have only recently come to light regarding futures markets. Sticking with the casino analogy, assume that you have had a bit of luck in the casino and decide to cash in your plastic chips. When you get to the cashiers counter it is closed with a sign saying "Run out of money. Come back tomorrow morning". You return the next day only to find a sign saying that the casino is bankrupt and is closed! Enquiries elicit the information that the cashier took all the casino's money, went to a nearby casino and lost the lot. In the futures market, the operator holds all the cash while the punters have contracts. The operator uses the cash to pay out the winners and cover expenses. Assume that the futures operator decides to take a risky position for the operator's own benefit in another market but uses the cash contributed by the punters. The risky venture goes sour and the operator goes bankrupt. The punters are left high and dry. While all the facts have yet to emerge, it seems that this is possibly what caused the demise of MF Global. As the world navigates this period of great financial and economic crisis, we need to be extremely vigilant and cautious with our investments. Be wary of paper claims on gold and always be conscious of the old saying: "Gear today, gone tomorrow". Limit investments to what one can afford to pay for in cash. To achieve the EW target of $4,500 on the next upward move will require something to trigger substantial new buying of gold. What could that event be? By definition, it will be a surprise to all market participants, a "black swan" event. That doesn't prevent us from making a guess. One likely area from which problems could emerge with very large numbers are derivatives. The Bank for International Settlements produces a list of outstanding derivatives twice a year. The latest report can be found at:http://www.bis.org/statistics/otcder/dt1920a.pdf. This reveals that the total notional value increased from $601 trillion (with a "t") at December 2010 to $707 trillion at June 2011. Nearly all of the increase was accounted for by interest rate contracts which now have a notional value of $553 trillion, some 78% of the total. As we discovered in 2008, derivatives are benign until losses occur. Once losses emerged from credit default obligations, it was game on for the GFC. Interest rate derivatives protect banks from interest rate rises. Most banks borrow short but have large loan books at fixed rates for long periods. Thus a big rise in interest rates could trigger claims on these derivatives. For the time being, rates seem to be locked at virtually zero in the USA, but this is not the case in Europe. Europeans are learning the lesson that rates rise when investors become concerned that the borrower can't repay the amount borrowed, let alone the interest on the capital. When we drill down further into the BIS statistic, we discover that $219 trillion of the interest rate derivatives are denominated in Euros, compared with $170 trillion denominated in US Dollars. If just 10% of the interest rate derivatives in Euro's produce losses, the world's banking system would be looking down the barrel of a loss of $22 trillion. That is enough to bankrupt the entire world's banking system, something that the politicians of the world could not tolerate. What would a bail out of $22 trillion do to financial markets? What would it do to the gold price? If it is not interest rates, there are $64 trillion of foreign exchange derivatives and a "mere" $32 trillion of credit default swaps outstanding that could produce "black swan" surprises.